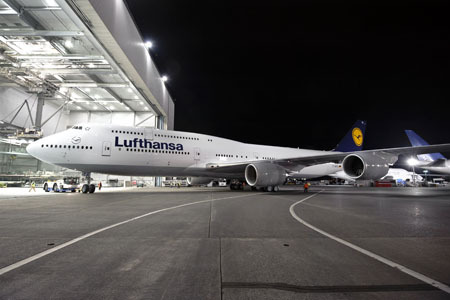 The FAA has issued Boeing certification for the 747-8 Intercontinental, the company’s newest and largest passenger airplane, clearing the way for first delivery to launch customer Lufthansa “early next year,” the company announced this afternoon. The FAA presented Boeing an amended type certificate (ATC) and the amended production certificate for the 747-8I today. Boeing expects the European Aviation Safety Agency (EASA) to issue its ATC for the airplane tomorrow. Boeing received its FAA and EASA certificates for the 747-8 Freighter in August. Two Intercontinental flight-test airplanes accumulated “a bit less” than 700 hours of testing since the first example took to the air in March and the second in April, while a third, non-instrumented aircraft flew some 200 hours of function-and-reliability testing. Featuring new General Electric GEnx-2B engines, a redesigned wing, new alloys in the fuselage and a new interior that can hold 51 more passengers and 26-percent more cargo in the lower hold than the 747-400 can carry, the Intercontinental also provides “double digit” improvements in fuel economy and carbon emissions per passenger and generates a 30-percent smaller noise footprint, according to Boeing. Boeing and Lufthansa conducted pre-delivery testing of the Intercontinental at the airline’s main operations base at Frankfurt Airport between December 6 and December 9. During the exercises, Lufthansa maintenance and engineering personnel rehearsed ground-handling processes within the airline’s facilities and on the airport’s ramps while ground support crews tested how their equipment accommodates the airplane. The airplane used to conduct the pre-delivery trials, known as RC021, had already tested interior systems, such as heating and air conditioning, cabin lighting and systems and galleys during the certification program. Boeing has taken orders for a total of 36 Intercontinentals, including 20 from Lufthansa, five from Korean Air, two from Nigeria’s Arik Air and nine VIP examples. It would seem that the term "Wins" certification might be somewhat inappropriate or misleading. A more descriptive title might have been that Boeing has "Earned" or "was Awarded" 747-8 Intercontinental FAA Certification. The main article does correct the imprerssion that obtaining the certification is like a card game that can be won or lost. I would hope that Boeing doesn't rely on "winning" or "losing" a certification in this extremely expensive endeavor. Congratulations to Boeing on another job well done. Just an observation from the cheap seats. Je trouve que malgré qu`il ne s`agit que de modifications, mais tout de même significatives, 700heures pour tester les systèmes d` un avion aussi important sont insuffisantes pour que la FAA et L`EASA octroient la certification.